From a microscopic perspective, the mechanical behavior of rocks can be well simulated by particle discrete element method. 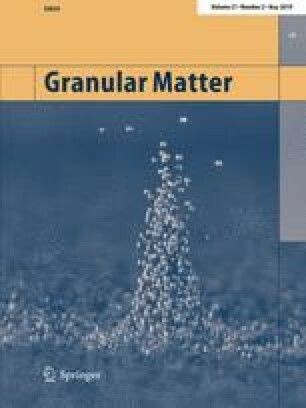 However, the ideal mechanical properties under macroscopic compression and tension conditions of the granular system require not only reasonable micro-parameters but also consider the mineral distribution in rock microstructure. In this study, the internal microstructure of granite was characterized based on digital images. The cellular automata method was used to construct a discrete element model of clustered particles, and a rapid and effective calibration method for rock microscopic parameters was established. Numerical results significantly relate with laboratory test results, and the microscopic mechanical parameters of the rock were rapidly predicted. Clustered discrete element model simulated the macroscopic mechanical behavior of the investigated rock by considering microscopic rock structure while ignoring particle shape. Results showed that bond strength ratio of the filler–matrix in the numerical sample can significantly affect the compressive–tensile strength ratio. Further, the internal mineral proportion and degree of mineral contact damage strongly influenced the macroscopic mechanical behavior of the investigated rock. Results of this study can provide basis for the construction of micro-scaled model and calibration of microscopic parameters for investigation of rock mechanical behavior. The National Key R&D Program of China (2018YFC1508501), the National Basic Research Program of China (973 Program) (Grant No. 2015CB057903), the National Natural Science Foundation of China (Grants Nos. 41831278, 51679071), and the Natural Science Foundation of Jiangsu Province (Grant No. B BK20171434) supported this work. The authors state that this article has no conflict of interest with anybody or any organizations.